I just returned home from our family vacation, relaxed from a break of the everyday—including the interwebs (save some Instagramming), work, and general day-to-day slother. Every few years the family changes up the location where the we all (the four of us, my parents, and my sister and brother-in-law) meet up. This summer we decided to visit Greenwood Lake in New York for the first time—a relaxing, sleepy place with great views, cooler-than-Maryland air, and a slower pace. It was wonderful. Like most vacations with my side of the family, we spent loads of time reading and doing puzzles, a nerdy blend of classic, non-internet-based fun. We also ate every meal in, but one. A money saver, but also less of a hassle, as far as I’m concerned—helped by the fact that we all love to cook! There was also plenty of time logged down on our dock, gazing out at the tree lined lake, and soaking in vitamin D.
While not warm by any stretch, the water was definitely refreshing when the sun was out in full force! 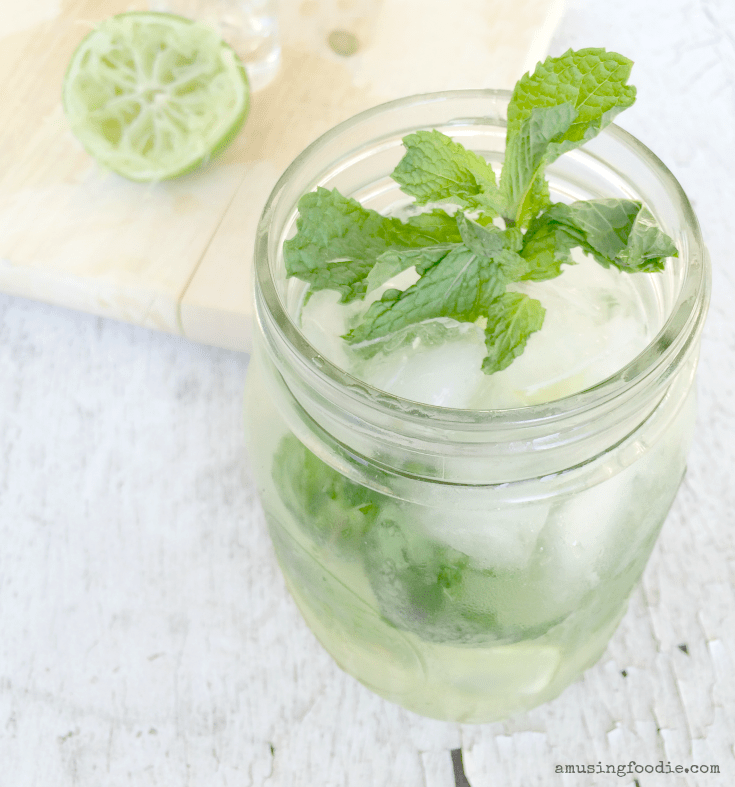 A classic mojito is a simple blend of rum, club soda, fresh mint leaves, limes, and sugar. 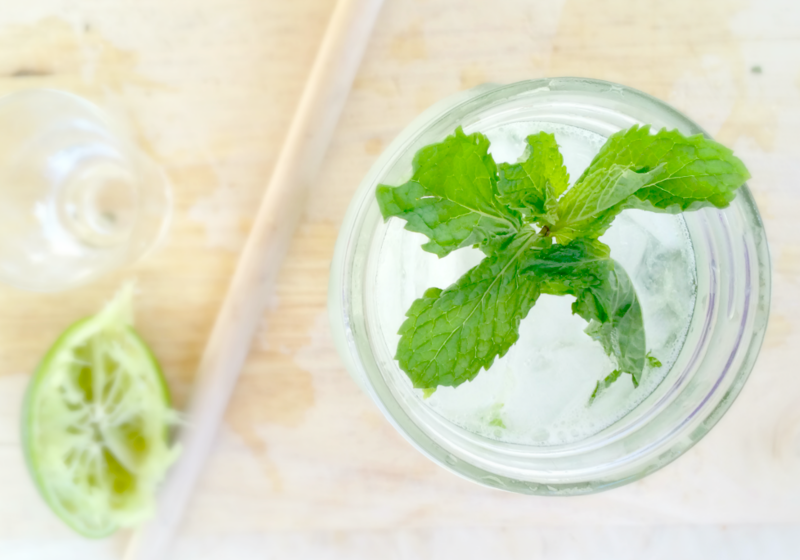 Anyway, to make these fantastically refreshing mojitos with gin, I sliced up half a lime into little wedges and dropped them into the bottom of a pint-sized mason jar. Then I poured simple syrup and fresh lime juice on top. Next up, a healthy clump of fresh mint. And then I used the handle of a wooden spoon to muddle it all together. Muddle is a fancy word for smash. Then I filled the mason jar with ice and poured the gin over top. Lastly, on went the lid, and I shook the heck out of it for one minute. It felt cold. Like REALLY cold. As in, “Was this mason jar in the freezer?” cold. This is good. 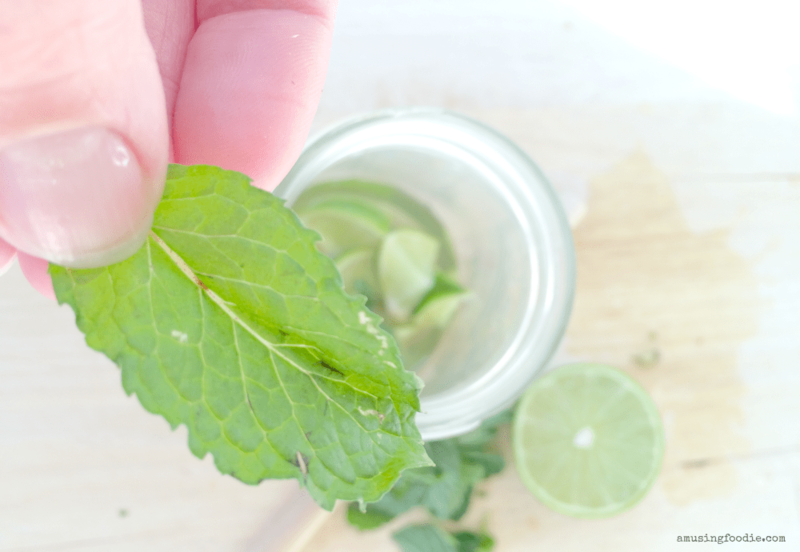 Last, but not least, I added club soda (or seltzer, or tonic water … some sort of bubble-fied water), along with more fresh mint (you can never have too much fresh mint in a mojito), and then we enjoyed the spoils! Cocktail purists may be cringing at that last step (rather than pour the shaken beverage over top a fresh glass of ice). I, on the other hand, think it’s both fun and practical to make a one cup cocktail! 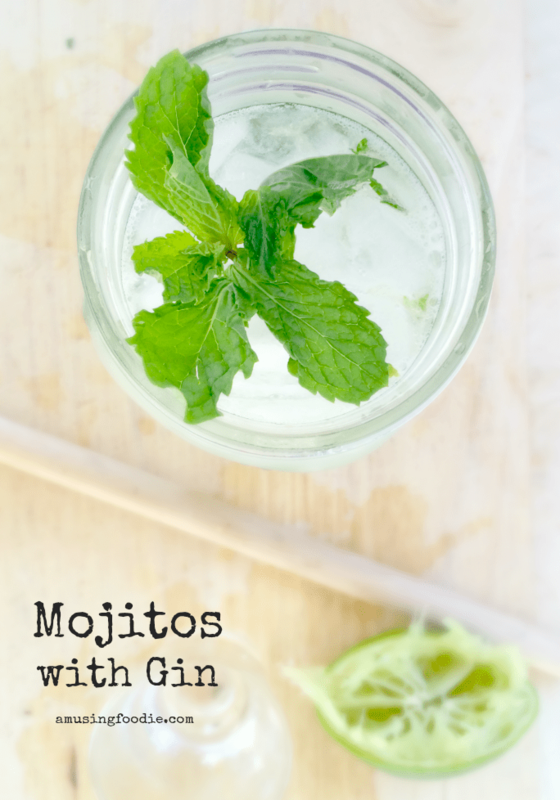 Mojitos with Gin is one of my reader favorites—find more here! 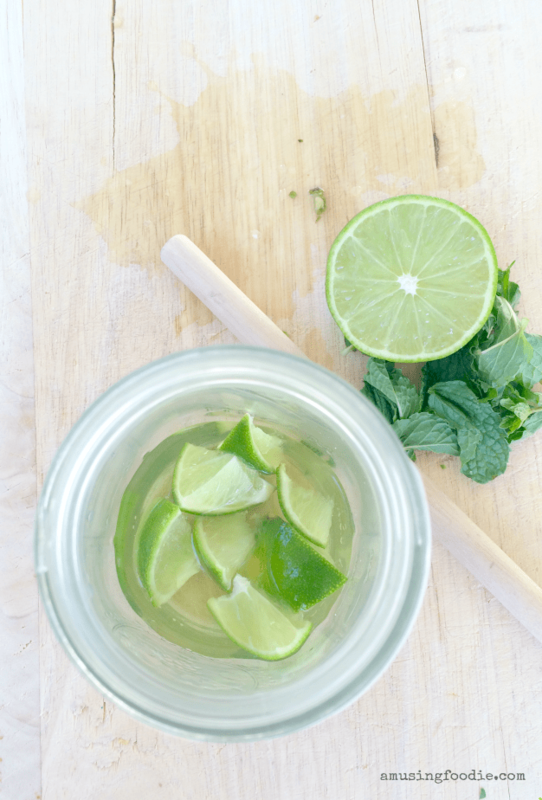 Mojitos with gin are the perfect twist on a classic cocktail! Slice the lime in half. Cut one of the halves into small wedges and drop them into a pint-sized mason jar. Squeeze the juice of the other half into the mason jar. 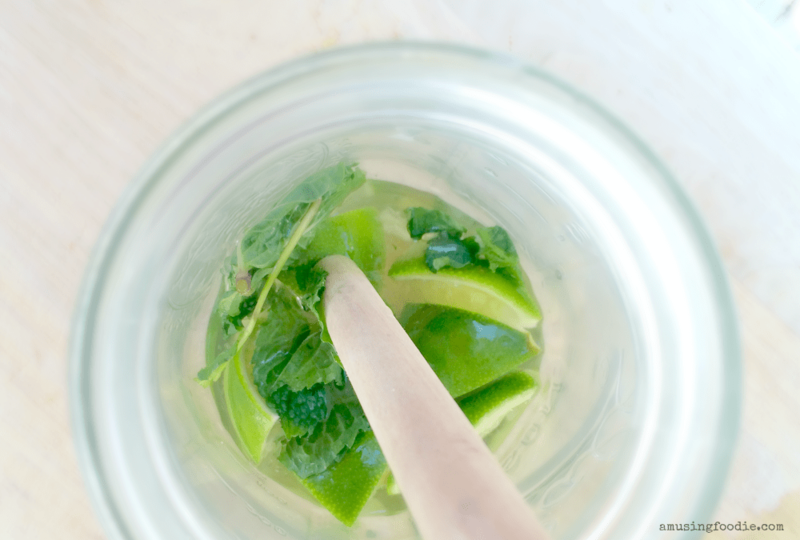 Add 15 mint leaves, the ice cubes, the simple syrup, and then the gin. Screw on the lid. *Simple syrup is easy to make — the ratio is 1:1 granulated sugar to water. Combine the sugar and water, and bring it to a boil (stove top in a pot, or in a Pyrex measuring cup in the microwave), then stir it until the sugar has melted. Let the simple syrup cool in the fridge, and then use as needed for cocktails, coffee, or other recipes.